When seeing Lukashenka in Minsk on 23​ April, the Russian Defence Minister Sergey Shoygu said that a Russian air regiment and an airbase will have been created Belarusian territory by 2015. Shoygu said that the first military planes would come to Belarus already this year. His statement did not provoke a negative response from Lukashenka at that meeting. Further, the Chief Commander of the Russian Air Force, General Victor Bondarev, said that an airdrome near the city of Lida (Hrodna region) had been set aside for accommodating the regiment of Russian fighter planes. First, the stock of Belarusian fighter planes consists of mainly Su-24 whose service life has expired and which must be written off. Fighter planes are needed for a properly functioning and reliable air defence system. Second, Russia exerts pressure on Belarus and reduces its oil supplies. The Belarusian side will have to agree to deploy Russian fighter planes also because it needs Russian oil. Deployment of a full-fledged Russian fighter air base is unlikely for the reasons discussed below. If Belarus agrees that Russian fighter planes can he deployed to its territory, the negotiating capacity of Belarus regarding subsidies from Russia will get weaker. Russia will be less dependent on Belarus regarding air defence support in particular, and regarding military safety in general. This is why Lukashenka said that the initiative of Shoygu was an encroachment on the sovereignty of Belarus. Lukashenka has several times said that deploying a US anti-missile defence system and developing NATO's military infrastructure in the territory of Eastern members of the Alliance was aimed against Russia. It is in the interest of Russia in the first place that Belarus has a reliable air defence system. Currently, Russia is not interested in being in conflict with Belarus. At large, several steps by Lukashenka's team (the release of the Uralkali CEO, end of the anti-Russian informational campaign – especially when the goals have been attained) can be enough to secure a sufficient quantity of Russian oil. Despite the reduction of oil deliveries, Belarusian officials are pretty optimistic in their assessment of their porspects for cooperation with Russia in the sphere of oil refining. One should take note of the respective statements of the First Vice Premier Vladimir Siamashka. He says that by the end of the year Belarus will have received 23 million tonnes of oil. On 11 October Lukashenka said that he had asked Putin to leave Belarus the revenue from oil products exports, part of which usually is transferred to the Russian budget. The sum is around four billion US dollars. It is unlikely that the Kremlin will decide in favour of this request. Russia has budgeted for revenues of 118.5 billion Russian rubles to come out of Belarus as an export tax for oil and petroleum products; the forecast for the same category revenue in 2014 is 112.9 billion Russian rubles. The initiative of Lukashenka indicates that official Minsk is optimistic about its chances to get a portion of the Russian oil pie, and at least as large of one as earlier. Lukashenka has plenty of domestic policy reasons not to agree to Russian military presence. 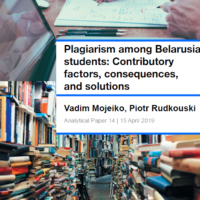 The fact that Lukashenka has been in power in Belarus since 1994 accounts for the fact, above all, that in authoritarian Belarus, like in other countries, authorities take into account public opinion, as well as the data of independent sociologists. According to an opinion poll, conducted by NISEPI in June 2013, less than 20 per cent of the respondents had a positive attitude towards the statement of the Russian Air Defence Minister Shoygu to deploy Russian air base in Belarus; 35.6 per cent said they were indifferent and 36 per cent were negative about it. The idea to turn Belarus into a frontline of the Russian defence is unpopular with Belarusian society. Lukashenka can hold large-scale shows with the participation of the Russian military. However, he must bear in mind what people think about real military cooperation with Russia. Perhaps, another factor is less significant here. Lukashenka is unpopular with the Belarusian army officer corps. Belarusian army officers often say that Lukashenka’s notion of the military sphere is dilettantish, and his concepts of military actions are at the level of the mid-20th century. A monthly salary of a Belarusian lieutenant colonel is equivalent to $650, whereas the salary of their Russian counterparts is RUR 64,000 (around $1,900). Lukashenka, therefore, has many reasons to be against frequent contacts between Belarusian and Russian military servicemen. Unlike in Russia, Belarus saves money on its army. Armed forces use ammunition from stores that were collected back in Soviet times. Lukashenka is not going to fight with anyone. He is concerned by domestic threats, and not by those outside the country. The financing priority goes to security, defence and law enforcement agencies aimed for affairs at home – the KGB and the Ministry of the Interior. After the presidential elections in 2010, Lukashenka’s praetorians got more convenient armour and shields with built-in electric shockers. An official myth describes Belarus as a country of mires and swamps. Indeed, Belarus has one of the largest wetlands on the continent, often the lungs of Europe. But peat extraction on an industrial scale in 1960s – 1980s led to the drainage of 51.2 % of its peatlands. Peat has been used mostly as a fuel for boilers for many years. As a result, just one third of Belarusian peatlands remains untouched. Nevertheless several years ago Deputy Prime minister of Belarus Uladzimir Siamashka declared that the golden era of peat briquette plants was coming and pointed out that government will make a huge investment into peat enterprises. To defend the last Belarusian mire public campaign In Defense of Belarusian Wetlands emerged. Activists started the campaign one year ago. Over this short period of time they spread information about the plans of the Belarusian government to start peat extraction in the areas of eight natural mires included in the list of protected territories of national importance and they managed to collect 17,000 signatures to prevent peat mining. Last summer the environmentalists had their first success. The rosecutor’s office declared the decision of Pukhavichy regional Executive Committee for the re-organisation of natural reserve Vetrevichsky as a wrongful act and, thereby, prevented the peat extraction in the protected area near Minsk. The main lobbyist of the peat extraction expansion became the Ministry of Energy which considers domestic peat an alternative to imported natural gas. According to the state program called Peat, established in 2008, peat extraction must be increased twofold by 2020. The catch is that most of the peat fields located throughout the country belong to the nation's land fund and its nature protection fund where extraction activities are forbidden, leaving only 7% of total its reserves open for extraction. The campaign In Defense of Belarusian Wetlands started after the issuance of The Government Decision from 17 June 2011. The document listed prospective areas for peat extraction and introduced changes to the allocation scheme of protected areas of national importance. The document allows for peat extraction to begin in the peatlands which belong to the nature protection fund. Proponents of peat extraction in protected areas argue that in 1960s–1970s these territories were a source of raw materials. According to their reasoning, if the country has economic problems and lacks its own energy resources, peat extraction in protected territories justified. Environmental NGOs experts disagreed with this reasoning. They claim that the extension of peat extraction in protected territories will have a negative influence on the climate, biodiversity preservation and lead to the depletion of water resources. In turn Belarus' ministry of environment officials have often reminded the public that an ecological evaluation should precede any mining. In cases of Vetrevichsky and Aziory natural reserves the expertise proved inexpediency of peat extraction. Moreover, the promotion of short-term profits for a few companies which leads to the destruction of wetlands ecosystem attracted the attention of foreign donors. For example, it caught the attention of United Nation Development Program which provides financial support for the "re-wetting" of Belarusian mires. That negatively influenced an already broken image of Belarusian authorities. The idea of the campaign belongs to participants of the Green Alliance association. A very young team that came up with an idea of the campaign In Defense of Belarusian Wetlands have never taken part in any opposition political movements, nor did they have nay experience with public campaigns. For that reason, the activists were able to successfully cooperate with officials and state media. The campaign caught the attention of independent media as well as official TV, which resulted in a TV report criticising peat extraction in protected territories. According to journalists mining activity can result in water resource depletion and a decrease in biodiversity. Many international environmentalist organisations also supported the activists. Surprisingly, together with Finnish Association for Nature Conservation and Czech Green Party, Marea Socialista movement supported the campaign. Marea Socialista belongs to The United Socialist Party of Venezuela whose ex-leader Hugo Chavez was a close friend and ally of Alexander Lukashenka. In Defense of Belarusian Wetlands activists travelled to wetlands areas, teamed with residents of local villages and provided legal assistance for local people to prevent peat extraction in those areas. The peat extraction issue did not have any political connotations and for that reason lawsuits from local residents had good chances for succeeding. It proved that the decision of the prosecutor’s office, which declared the decision of Pukhavichy regional Executive Committee for reorganisation of zakaznik Vetrevichsky as an illegal act and, further on, prevented peat extraction in the protected area near Minsk. In addition, activists collected 17,000 signatures for the abandonment of plans for the destruction of 8 natural mires included in the list of protected territories of national importance. They also organised dozens of activities such as exhibitions, art performances and lectures aiming to make people aware about threats to the wetlands. Despite the successes of the campaign, the probability of peat extraction in protected territories persists. Celebrating the one year anniversary of the campaign, the activists’ coordinator Ola Kaskevich mentioned that the current situation with four wetlands situated in protected areas is still unclear and a huge work has to be done to prevent peat extraction in these territories. The struggle in defense of wetlands continues and it is difficult to predict its outcome. The obvious fact, however, that the wetlands campaign is unique for Belarus. The activists of the campaign have avoided any repressive measures. Moreover, they were able to cooperate with officials and effectively use legislation and courts to achieve their goals. But, such “liberalism” would impossible if wetlands issue concerned politics or ruling business elites. For example, activists of campaign against Belarusian nuclear station construction are constantly subjected to repression. Exactly the same way environmentalists are not able to influence the decisions on real estate construction in places originally used for recreation. Nevertheless, the wetlands campaign demonstrates that the Belarusian environmentalist movement has potential. It also serves as a positive example that local people in cooperation with NGO activists can influence the cloudy decision making process of authoritarian state institutions.